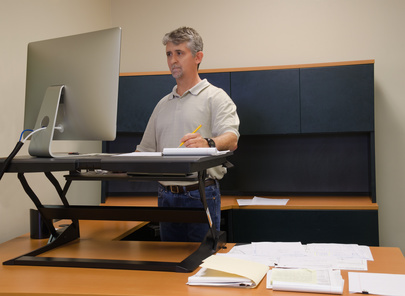 Chances are you know someone with a standing desk. Maybe it's the coworker right next to you. Or maybe it's the guy down the hall whose head and shoulders bob up and down above all the other cubicles. Standing desks are said to help burn calories, reduce low back and neck pain, and now it is reported they may even boost work productivity...by up to 46%. A recent study published in the journal IIE Transactions on Occupational Ergonomics and Human Factors examined employees at a call center for a pharmaceutical company over a six-month period. Some participants were issued new standing desks, and others remained sitting at traditional desks. Regular daily tasks completed successfully at the standing desks were talking on the phone, watching videos, and reading on the computer. Tasks that were markedly more difficult to perform while standing were typing on a keyboard and maneuvering the mouse. White the boost in productivity that comes from standing at a desk is attractive to many employers, experts suggest that a combination of standing and sitting while working may be the most beneficial. Figure out which tasks you perform better while standing and then sitting, and alternate your position throughout the day. This gives you both the energetic boost of being on your feet while also providing needed rest and physical support as your complete seated tasks. Ideally, whether you sit or stand at your desk, you should work frequent "microbreaks" into your daily schedule. At least every hour, take a moment to stretch your limbs and look away from your computer screen. A short walk, quick head and neck rolls, or even arm and ankle circles can greatly improve blood flow and circulation...also leading to increased productivity.